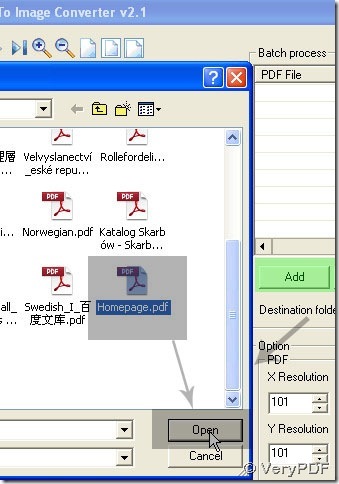 ← How to add Wingdng2 image as annotations to PDF files with VeryPDF PDF Editor? PDF To Image Converter v2.1 is a strongly functional converter in this field. You can get its trial version here: http://www.verypdf.com/pdf2tif/pdf2image.exe. WMF stands for Windows Metafile Format. Metafile means that this file contains information that describes or specifies another file. WMF was introduced by Microsoft. WMF saves space already-built comparing with bitmaps especially when many bitmaps are used repeatedly by different components of the operating system or of an application. WMF contains a series of drawing operations, including commands for drawing lines, circles, and rectangles. It may also contain bitmap drawing operations which is used primarily for vector images, but can also include raster graphics. 1. Make your pdf appear in preview area after you put it under PDF File in PDF To Image Converter v2.1. Then removing its route or not is your choice by clicking Remove or Remove all buttons. 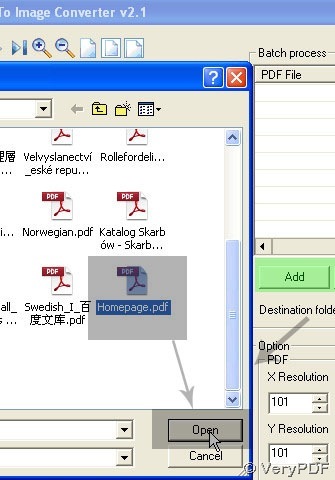 Use icons in azury field in the picture above to check on your pdf in PDF To Image Converter v2.1. 2. Please keep 1 in From and 2 in To to get 1st and 2nd pages of your pdf converted: click Page range > From= 1 > To = 2, and File type > WMF, Destination folder > Browse > folder > ok.
3. Cause WMF is a vector graph with lossless compression, too, however DPI(effictive on dimension in vector image) and Image bitcount in color and clearness are effictive in bitmap image, give them defaulting set as same as Compression in PDF To Image Converter v2.1. 4. 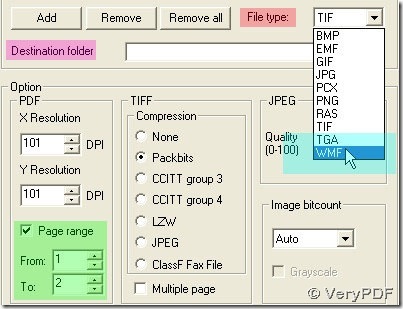 Now click Convert to get your WMF image in PDF To Image Converter v2.1. You will get a perfect WMF image without any loss in quality from PDF to Image Converter . How to converter pdf to wmf with bigger dimension? Do we need to set dpi as 300 in each pdf file when getting several missions on converting pdf to wmf? I want a grayscale ras image, so how to convert pdf to ras? This entry was posted in PDF to Image Converter and tagged PDF To Image Converter, pdf to wmf, pdf2image. Bookmark the permalink.